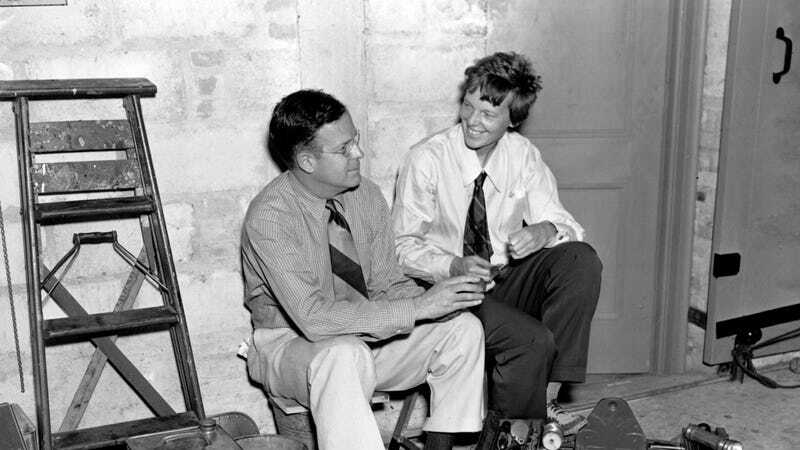 Amelia Earhart and the husband of Amelia Earhart. Image via the AP. Adding to the mountains of Amelia Earhart flotsam and jetsam which washes up year after year (especially this year, with new investigations involving forensic dogs, satellite imagery, and the History Channel), David Dunlap at the New York Times has unearthed an old letter to the publisher from Amelia Earhart, who’d asked that the paper stop referring to her by her husband’s name. And now, we know her as Amelia Earhart. I admit I have no principle to uphold in asking that I be called by my professional name in print. However, it is for many reasons more convenient for both of us to be simply ‘Amelia Earhart.’ After all (here may be a principle) I believe flyers should be permitted the same privileges as writers or actresses. She still found her husband’s name “grand” for “social purposes,” she wrote. (Her husband came from a famous publishing family). The paper did indeed honor her request, and it probably helped that they were friends, or friendly enough for her to hit them up for money when she was abroad and needed a loan.